The brainstorming phase of Build Season is over! Spartronics has split up into its subteams, where everyone’s working hard together to construct a great robot. Students in the Mechanics subteam have finished prototyping, and are moving on to finalizing various mechanism designs. 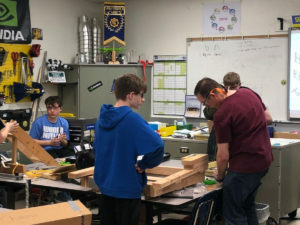 They’ve also split up into five groups who, aided by students working on CAD and Electronics, are working on various elements of the robot’s design. The subteam hopes that they’ll be able to begin building within the next few days! The Electronics subteam is helping all but one of the aforementioned groups in the Mechanics subteam with the electronics in their designs. 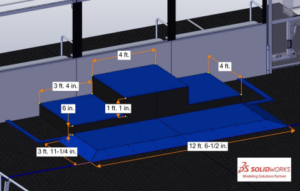 They’ve also managed to secure space in the overall robot’s design for electronics. Programming has also been keeping busy. They’ve done some initial coding, but are waiting until more details of the robot’s hardware are finalized to do more. Additionally, they’ve also got a camera working. This provides an additional option for this year’s Sandstorm phase. Spartronics is excited to announce its membership in the Peninsula Alliance. 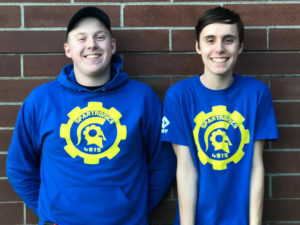 The Peninsula Alliance is a new organization which is coordinating the efforts of six participating teams in order to construct a practice field for this year’s game at Central Kitsap High. The six teams are Spartronics (Team 4915), ROCK (Team 3223), Roboctopi (Team 4918), SRF (Team 3826), Bremertron (Team 3049) and Aldernating Current (Team 5295). Co-Captains Cruz Strom (left) and Declan Freeman-Gleason (right) have been named by the team’s professional mentors and Coach Chee as the team’s nominees for the 2019 Dean’s List Award. Sponsored by the Kamen family, the award aims to recognize students with exceptional leadership, creative or technical abilities who best represent FIRST’s values. Finalists will be chosen at the regional or state level and winners will be selected at the World Championship. Cruz, the Mechanical subteam lead, and Declan, the Programming subteam lead, both said that they were “honored” to be nominees. We wish them both the best of luck! Jason Shutt is a leading real estate broker on Bainbridge Island recently joined the island’s leading brokerage firm, Windermere Real Estate. Jason specializes in “waterfront neighborhoods” on Bainbridge, and is website — jasonshutt.com — uniquely features profiles of the 10 waterfront neighborhoods he’s identified for Bainbridge Island, including a breathtaking aerial tour video. Students may know him as “Mr. Shutt,” a former well-known science teacher at Woodward. Today he’s also a prominent community leader and a perennial Spartronics Sponsor. Spartronics: Can you give us a brief description of what you do? 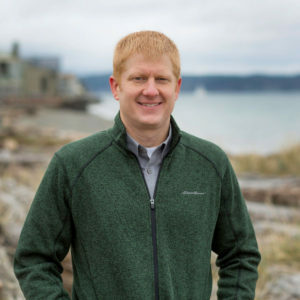 Jason: I am a Realtor on Bainbridge Island who helps people make well informed and strategic real estate decisions. For people selling a home, I help reduce their stress and work to put them in the best position to maximize the return on their investment. For those who are buying a home, I acutely listen to assess their needs and understand the lifestyle they are seeking to help them find the home on the island that’s just right for them. When people are both buying, and selling, I work to ensure the timelines of the two transactions are well thought out so the process is as smooth as possible. Spartronics: Why are you supporting Spartronics? Jason: When I was a science teacher at Woodward Middle School, my goal was always to get kids out of their seats and actively engaged in problem-solving activities where they built confidence by finding success under their own determination. What I see in Spartronics is just that: an opportunity for students to collaborate in teams and pursue their own ideas for the ultimate problems solving, engineering. The successes I see on the kids’ faces, and in the program itself, tell me it’s a “teaching style” that I favor. Except, instead of some elemental understanding of Newton’s Laws or plate tectonics, the outcome of Spartronics is experiential learning in the values of teamwork and goal accomplishment; those are preparing you all for life in much grander ways. Spartronics: How can Spartronics fans support you? Jason: For any adults who are interested in an analysis of the island’s real estate market, they can view my 99-second infographic here, and sign up for monthly delivery. Liking my Facebook Page and Instagram profile is always appreciated as well. Thank you Jason Shutt! We greatly appreciate your support! Also check out his website that features some super-cool videos (shot by a team that includes a Spartronics’ alumni) and a GREAT list of the Public Beach Access Points across Bainbridge Island. ← Build Season is Ramping Up! Week 1!